Re-Nu Refinishing is a family owned business that has been serving the Greater Sacramento area since 1988. We strive to provide our customers with the highest quality service and workmanship possible. We stand behind all the work we do, and we are not happy unless you are. 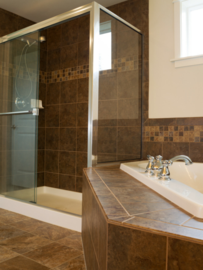 We can restore your worn and damaged bathtubs, sinks, countertops, and showers at a fraction of the cost of replacement. We provide refinishing work to customers in Rocklin, Sacramento, Folsom, Yuba City, Placerville, Elk Grove, and Truckee. We typically travel within 50-miles of Rocklin. You can contact us for more information. If your tub is stained, chipped, or worn, or you would just like to change the color, we can make it look like new. Whether your tile is cracked, chipped, missing, grout or just outdated, we can restore it to a new condition. Tile, formica, and cultured marble can all be refinished in either solid colors or our multi-stone finish to give them a modern look. We can bring fiberglass or acrylic shower pans and one-piece tub/shower units back to life.